So far I’ve been able to draw all parts in 2.5D with Inkscape and Estlcam. This is not possible however for the trim wheels which have quite a complex shape. From designing the 3D model of the CNC router I have experience with Sketchup, but some interesting import and export functions unfortunately are not available in the free Sketchup Make version. On internet I found two free Sketchup extensions though: a plugin to import SVG format so that 2D designs from Inkscape can be imported and an extension to export a Sketchup design to 3D STL format. 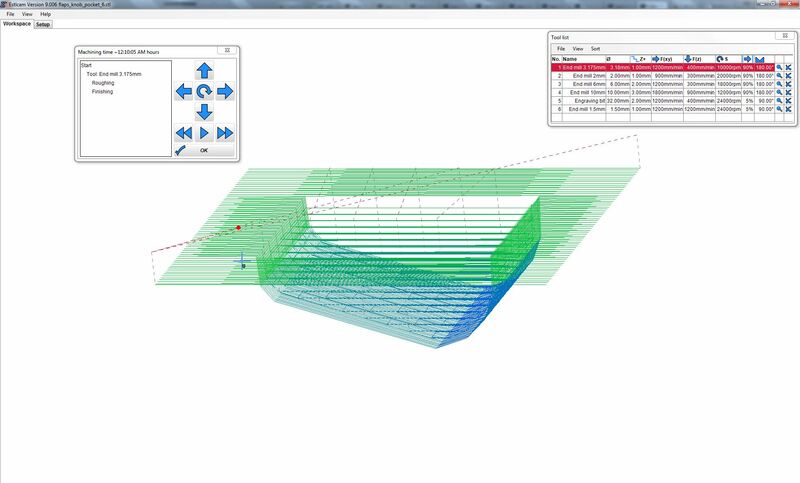 STL can be read by Estlcam to create 3D toolpaths. 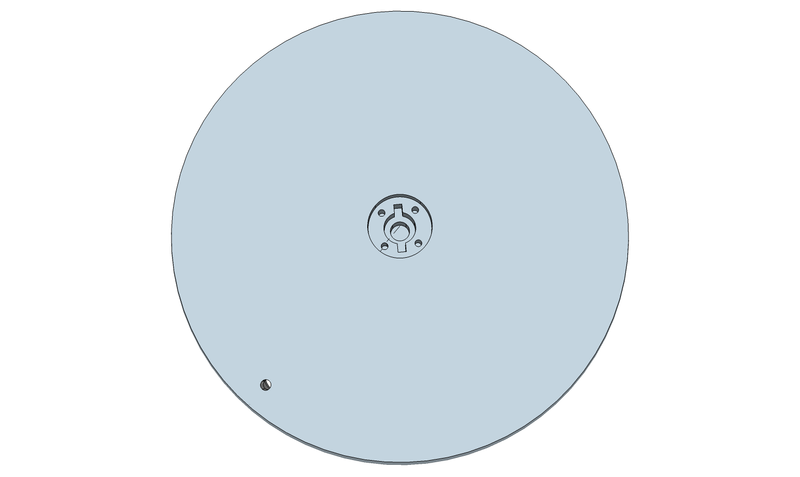 The design of the trim wheels started with importing a top view photograph in Inkscape. I used this to draw a 2D toplevel view of the trim wheel. On eBay I found two foldable handles for a nice price that I want to use for the trim wheels.They’re a bit longer than the real handles however so I had to scale the wheel a bit larger so that they fit in it. The 2D SVG design then was imported in Sketchup and a 3D design was created from it. The folllowing video was created before I found the Sketchup SVG import extension, so in the video the 2D design from Inkscape is tranferred to Sketchup via a PNG bitmap. Using the SVG import extension is easier however because the imported 2D SVG design can be edited in Sketchup (after exploding the grouped objects several times). Sometimes it was required to redraw some of the lines because they did not perfectly join, but in general working with an imported SVG is easier than with an imported PNG bitmap. Before creating the trimwheels with the CNC router I have tested this new workflow with a smaller 3D object, because I have a 32mm MDF plate that is just large enough for the two trimwheels and routing the trim wheels takes a number of hours because of their size. This smaller 3D test object is a pocket in an MDF plate with the shape of the flaps knob. It is used to fix the knob to the router table so that the hole at the bottom of the knob can be created here the knob is mounted to the handle. To save time on CNC routing I created the 2.5D design (holes for the fixture bolts) for the plate with Inkscape / Estlcam and used the Sketchup STL / Estlcam design only to route the 3D pocket. Estlcam has two different modes for handling STL files: free machining and block machining. 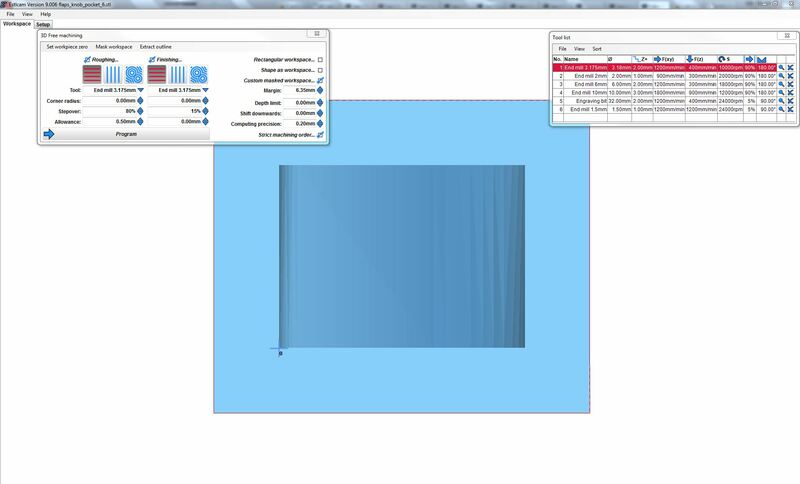 Initially I had a look at block machining, but in this mode it is not possible to set the origin and the tool sets it fixed at the left bottom edge of the workpiece while I wanted it at the left bottom edge of the 3D pocket, so I had to fiddle around with the workspace size and margins. 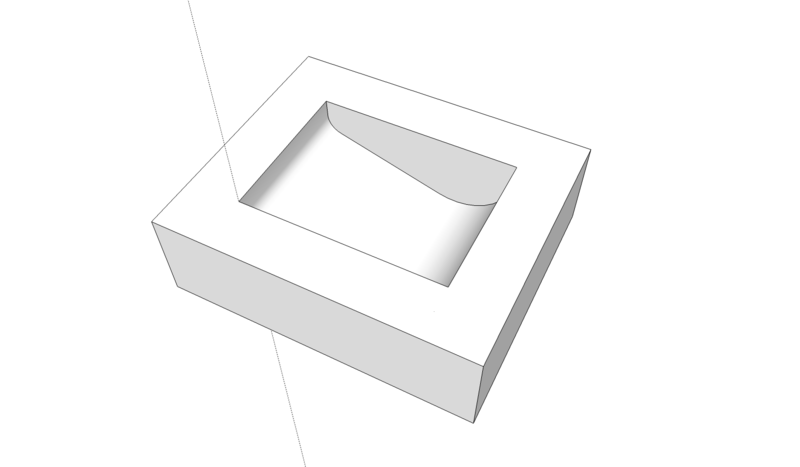 Also I had to use a trick to make sure that the object is not cut out at the workspace edges: I managed to do this by defining holding tabs that are the complete length of the workspace and the height of the MDF plate. Free machining mode was easier because in this mode you can set a custom origin and by selecting ‘Custom masked workspace’ the object is not cut out at the edges. I only haven’t found yet if and how I can do two sided machining with free machining mode. 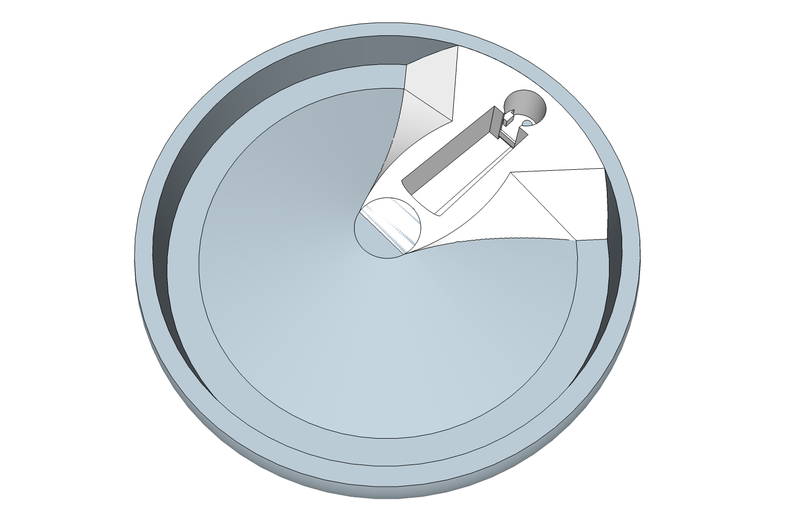 For the flaps knob pocket it’s not required, but for the trim wheels it is because of the rounded edges and the pocket for the flange at the backside. 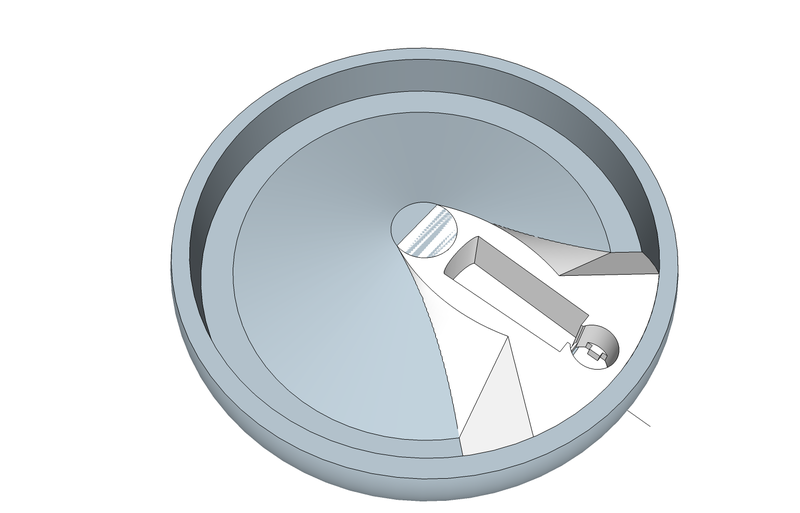 The flaps knob fits nicely in the pocket, so the flow is ready for creating the trim wheels.